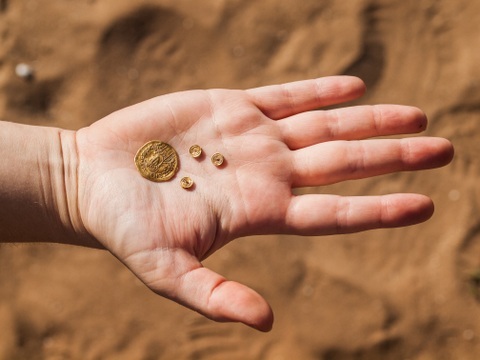 Researchers are examining what 400 Byzantine coins, 200 Samaritan lamps, an ancient ring with an inscription and gold jewelry were doing in a refuse pit from the Byzantine period? 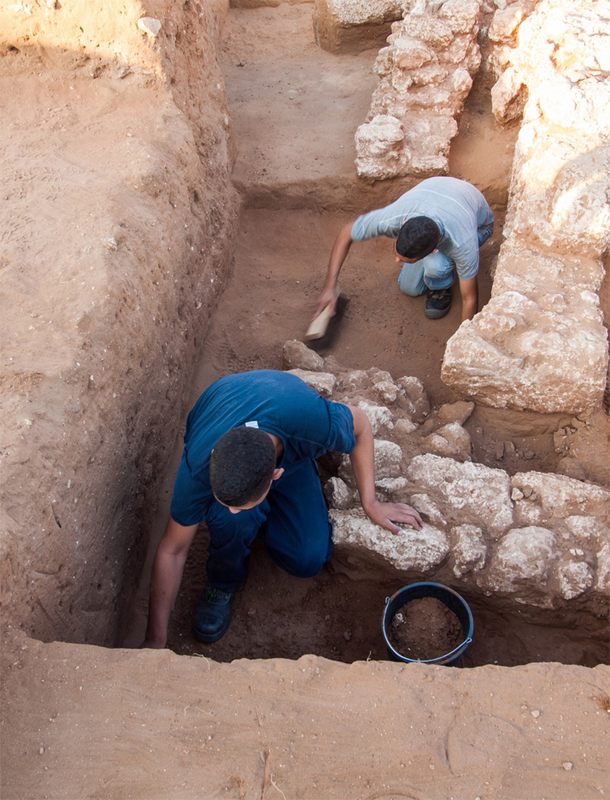 The archaeological excavations on behalf of the Tel Aviv University and the Israel Antiquities Authority have given rise to a mystery. The excavations, funded by the Israel Land Authority prior to expanding the city of Herzliya, are being conducted between the coastal road and the Israel Militaries Industries plant in an area located between Kfar Shmaryahu and Rishpon. According to Professor Oren Tal of the Tel Aviv University and Moshe Ajami of the Israel Antiquities Authority, “The most intriguing find in the area is a number of Byzantine refuse pits. One of them is especially large (more than 30 meters in diameter) and contained fragments of pottery vessels (jars, cooking ware, tableware and lamps), fragments of glass vessels, industrial glass waste and animal bones. In the midst of the many sherds that were discovered in the big refuse pit was a large amount of usable artifacts, whose presence in the pit raises questions. Among other things, more than four hundred coins were found which are mostly Byzantine, including one gold coin, as well as two hundred whole and intact Samaritan lamps (among them lamps that were never used), rings and gold jewelry. Noteworthy among the jewelry is an octagonal ring with parts of verses from the Samaritan Pentateuch engraved in Samaritan script on each of its sides (one side reads: Adonai is his name, another side: One God, and so on). 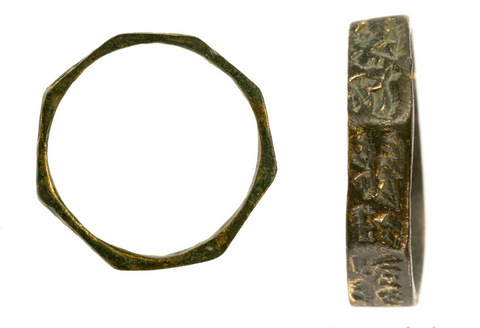 Approximately a dozen Samaritan rings have been published so far in scientific literature, and this ring constitutes an important addition given the assemblage in which it was discovered”. Archaeological excavations conducted in the Apollonia National Park from the 1950’s until the present indicate that the site was inhabited continuously for more than 1,500 years – from the Persian period (late sixth century BCE) until the end of the Crusader period (thirteenth century CE). The most important architectural find from Roman Apollonia is a villa that faces the sea with a peristyle courtyard flanked by a peripheral corridor and rooms arranged along all sides of it. In the Byzantine period the settlement Sozousa (Apollonia) extended across an area of c. 280 dunams. Among its finds are a church and industrial quarters with wine presses, olive presses, plastered pools and kilns used to produce raw glass, and its population comprised both Christians and Samaritans inhabitants. During the reign of the Umayyad caliph Abdul al-Malik (685–705 CE) Arsuf was enclosed within a city wall. At the end of the period the settlement was turned into fortress where Muslim religious sages were active. The site was conquered by the Crusaders in 1101. By the middle of the twelfth century the site was turned over to the one of the aristocratic Crusader families and became the center of a feudal manor (seigniory). The construction of the fortress at the seigniory began in 1241 and in 1261 control of the fortress, the city and the fief of Arsuf (Arsur) was handed over to the Knights Hospitaller. By the end of the Mamluk siege in March–April 1265 the fortified city and the fortress in its north were destroyed and since its defeat the site has never been reoccupied.